First startup wizard will helps you to make all necessary steps for successful Q4Wine setup. You can navigate through setup process by pressing Next button to go to the next wizard's page, or by pressing Back button for return. On this step you will need to specify wine paths. Note: in most case q4wine will try to detect wine binaries paths automatically. If it fails specify them manually. wine bin Wine binary loads and runs the given program, where the program is a DOS, Windows 3.x, or Win32 executable. Set here path to main wine binary file. Usually it is /usr/bin/wine. wine server Wine server is a daemon process that provides to Wine roughly the same services that the Windows kernel provides on Windows. Set here path to wineserver binary file. Usually it is /usr/bin/wineserver. 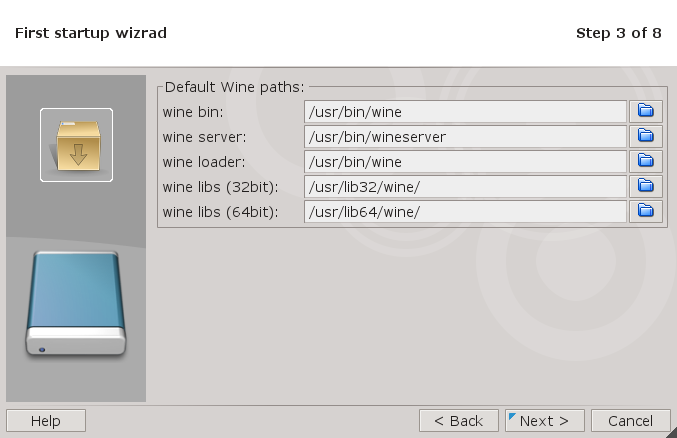 wine loader Specifies the path and name of the wine binary to use to launch new Windows processes. wine libs (32 bit) Specifies the path in which to search for builtin dlls and Winelib applications. Set here path to wine 32 libs directory (if present). Usually it is /usr/lib32/wine. wine libs (64 bit) Specifies the path in which to search for builtin dlls and Winelib applications. Set here path to wine 64 libs directory (if present). Usually it is /usr/lib64/wine. On this step you will need to specify system utils paths. Note: in most case q4wine will try to detect system utils paths automatically. If it fails specify them manually. tar The GNU version of the tar archiving utility. It will be used for prefix export and import (backup) functions. Set here path to tar binary file. Usually it is /bin/tar. mount mount is a binary then allows q4wine to mount a CD images or CD drive. Set here path to mount binary file. Usually it is /bin/mount. umount umount is a binary then allows q4wine to unmount a CD images or CD drive. Set here path to umount binary file. Usually it is /bin/umount. sudo sudo allows a permitted user to execute a command as the superuser or another user, as specified in the sudoers file. See q4wine sudo faq for details. Set here path to sudo binary. Usually it is /usr/bin/sudo. gui sudo This is a path to GUI sudo frontend such as kdesu. gksu or xdg-su. If you don't wish to use GUI sudo front end set it to sudo binary. Also see q4wine sudo faq for details. nice nice allows q4wine to run a program with modified scheduling priority. Set here path to nice binary. Usually it is /usr/bin/nice. renice renice allows q4wine to alter priority of running processes. Set here path to renice binary. Usually it is /usr/bin/renice. sh sh is shell, the standard command language interpreter. Set here path to sh binary. Usually it is /bin/sh. On this step you will need to specify user utils paths. Note: in most case q4wine will try to detect user utils paths automatically. If it fails specify them manually. Console Terminal emulator for the X Window System which will be used for running wine application in console mode. There different terminal emulators like konsole, xterm, e.t.c... Also you will need to specify terminal arguments. Set here path to terminal binary file. Icoutils Converts and creates Win32 icon and cursor files. 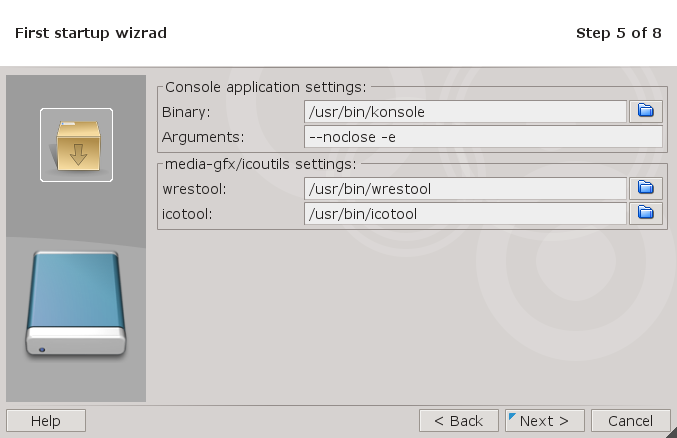 In some configurations, support for icoutils can be disabled. You can specify HTTP or Socks v5 proxy. Proxy settings will be used for winetriks installation process and q4wine network functions like AppDB browser e.t.c. This screen gives you ability to select different mount profiles. Mount profile is a set of mount strings with will be used for mounting and unmounting cd images and/or drive. sudo This profile will use sudo binary to run mount\umount bnaries. Note: q4wine will not ask user password for sudo by itself. You need to read Post installation guide to setup sudoers file. 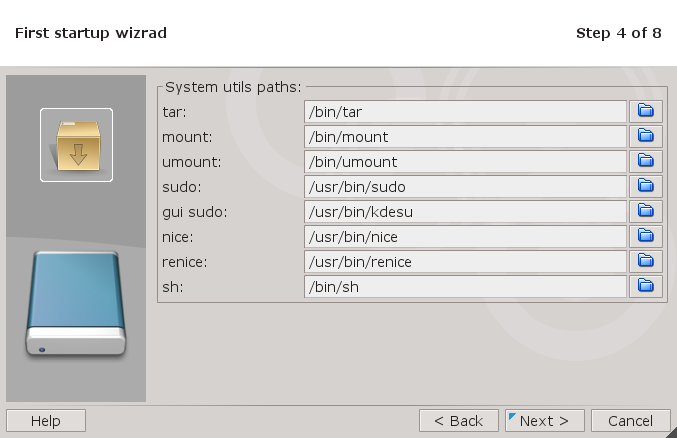 gui sudo This profile will use gui sudo binary to run mount\umount bnaries with root\user password prompt before running command. 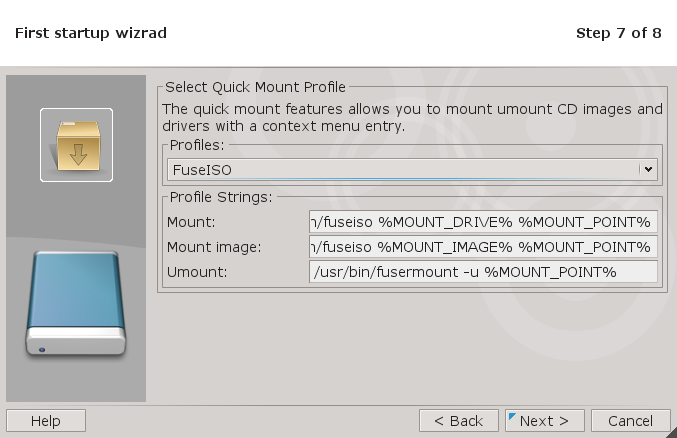 FuseISO This profile will use FuseISO application which is an FUSE module to mount ISO filesystem images such as .iso, .nrg, .bin, .mdf and .img files. It currently support plain ISO9660 Level 1 and 2, Rock Ridge, Joliet, and zisofs. to mount/umount images via fuse. Note: This is most preformed profile for q4wine usage. %SUDO% Contains path to sudo binary. %GUI_SUDO% Contains path to gui sudo binary. %MOUNT_BIN% Contains path to mount binary. %UMOUNT_BIN% Contains path to umount binary. %MOUNT_DRIVE% Contains path to device which will be mounted. %MOUNT_POINT% Contains path to mount point. %MOUNT_OPTIONS% Contains default mount options for image mount: "-o loop". %MOUNT_IMAGE% Contains mount image path. Where /home/brezerk/mymount.sh is a path to you own mount script.